Six months ago, Lucas Davenport tackled his first case as a statewide troubleshooter, and he thought that one was plenty strange enough. But that was before the Russian got killed. On the shore of Lake Superior, a man named Vladimir Oleshev is found shot dead, three holes in his head and heart, and though nobody knows why he was killed, everybody - the local cops, the FBI, and the Russians themselves - has a theory. And when it turns out he had very high government connections, that's when it hits the fan." A Russian cop flies in from Moscow, Davenport flies in from Minneapolis, law enforcement and press types swarm the crime scene - and, in the middle of it all, there is another murder. Is there a relationship between the two? What is the Russian cop hiding from Davenport? Is she - yes, it's a woman - a cop at all? Why was the man shot with ... fifty-year-old bullets? Before he can find the answers, Davenport will have to follow a trail back to another place, another time, and battle the shadows he discovers there - shadows that turn out to be both very real and very deadly. John Sandford is the pseudonym of the Pulitzer Prize-winning journalist John Camp. Camp was born in 1944 and was raised in Cedar Rapids, Iowa. He received his B.A. in American Studies from the University of Iowa, and received his first training as a journalist and reporter when he was in Korea for 15 months working for his base paper. After the army, Camp spent 10 months working for the Cape Girardeau Se Missourian newspaper before returning to the University of Iowa for his Masters in Journalism. From 1971 to 1978, he worked as a general assignment reporter for the Miami Herald, covering killings and drug cases, among other beats, with his colleague, the Pulitzer Prize-winning journalist Edna Buchanan. In 1978, Camp joined the St. Paul Pioneer Press as a features reporter. He became a daily columnist at the newspaper in 1980. In the same year, he was named a finalist for the Pulitzer Prize for an article he wrote on the Native American communities in Minnesota and North Dakota and their modern day social problems. In 1986, Camp won the Pulitzer Prize for feature writing for a series of articles on the farm crisis in the Midwest. 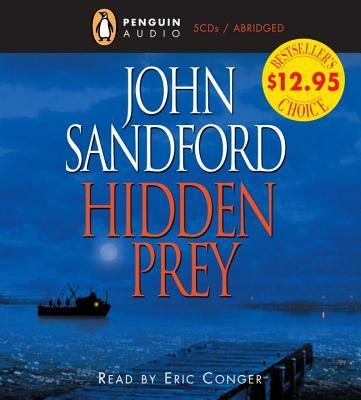 Camp has written fourteen books in the bestselling "Prey" series under the name John Sandford. The titles in this series, which features Lucas Davenport, include Rules of Prey, Shadow Prey, Eyes of Prey, Silent Prey, Winter Prey, Night Prey, Mind Prey, Sudden Prey, Secret Prey, Certain Prey, Easy Prey, Chosen Prey, Naked Prey, Broken Prey, Invisible Prey, and now, Phantom Prey.